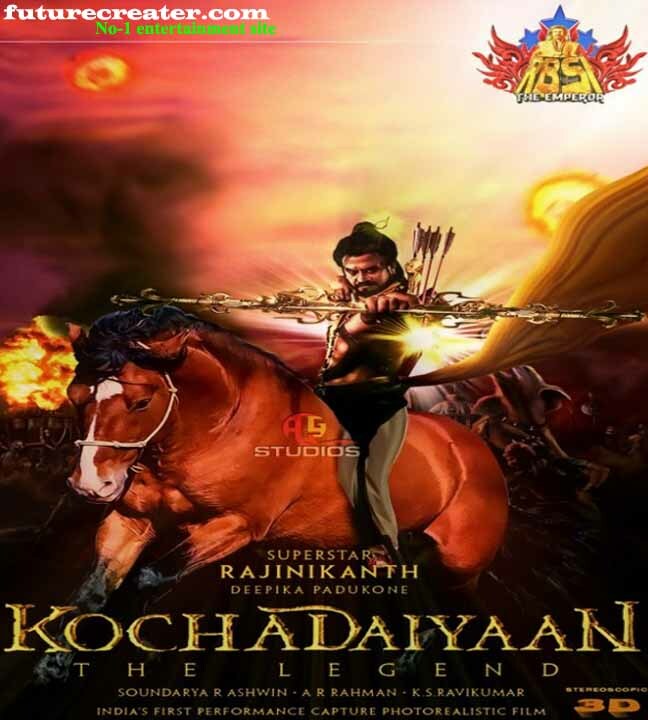 Kochadaiyaan is an upcoming Tamil period film to be directed by Soundarya R. Ashwin and written by K. S Ravikumar. The film will feature Rajinikanth alongside an ensemble cast, includingSarathkumar, Deepika Padukone, Rukmani, Aadhi, Shobana, Nassar and Jackie Shroff. The film, which is expected to be shot with motion capture in 3D, will have cinematography handled by Rajiv Menon whilst background score and soundtrack will be composed by two times academy awards winner A.R Rahman. Directed by Soundarya R. Ashwin, Cinematography by Rajiv Menon, Music by A.R Rahman. Kochadaiyaan is India’s first performance capture photo realistic 3D movie written by K.S Ravikumarand directed by Soundarya R. Ashwin & produced by Eros Entertainment & Media One Global. 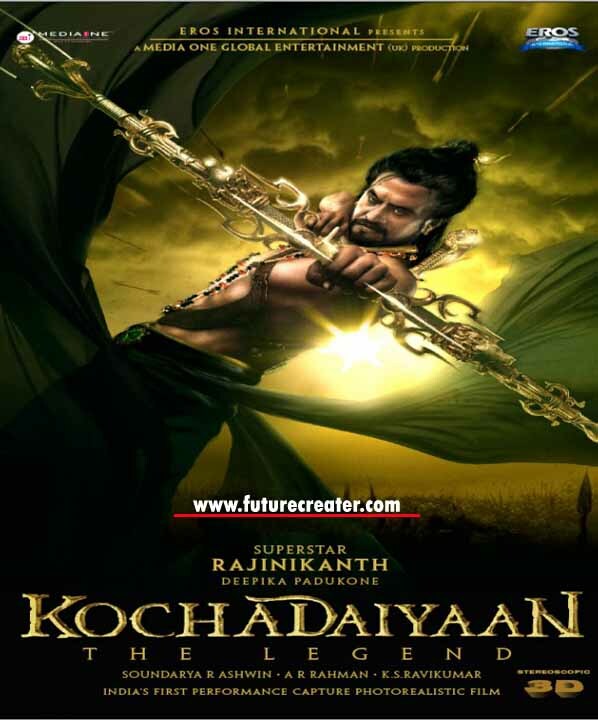 Starring Superstar Rajnikanth, Deepika Padukone, Prithvi Raj, Sarathkumar, Rukmani, Aadhi,Jackie Shroff and Shobana, Kochadaiyaan is expected to hit the screens in August, 2012. Kochadaiyaan is a Superstar Rajnikanth starrer, being directed by his younger daughter Soundarya R Ashwin. The film will be her directorial debut. The movie is produced by Sunil Lulla under the banners Eros Entertainment & Media One Global. Kochadaiyaan will be India’s first performance capture photo realistic 3D film. Performance capture is an animation technique used by Steven Spielberg for his recent award winner The Adventures of Tintin (2011). Kochadaiyaan‘s story and screenplay is written by ace Director KS Ravikumar. Bollywood actressDeepika Padukone is playing opposite Rajnikanth. Prithvi Raj, Sarathkumar, Rukmani, Aadhi,Jackie Shroff and Shobana are playing pivotal roles in this film. The movie is all about one of the great Pandiyan Kings, Kochadaiyan Ranadhiran, the son and successor of Arikesari Maravarman, who ruled the ancient Tamil kingdom between 670 & 710 AD. Superstar Rajnikanth plays the title role as Kochadaiyan Ranadhiran. Academy award winner AR Rahman will compose the music while Rajiv Menon handles the camera. Kochadaiyaan is expected to hit the screens in August, 2012.